At today's CES 2018, Nvidia revealed what the company calls Big Format Gaming Displays (BFGD). Nvidia calls it the "world's first big-screen PC gaming display" that is optimized for PC gaming. 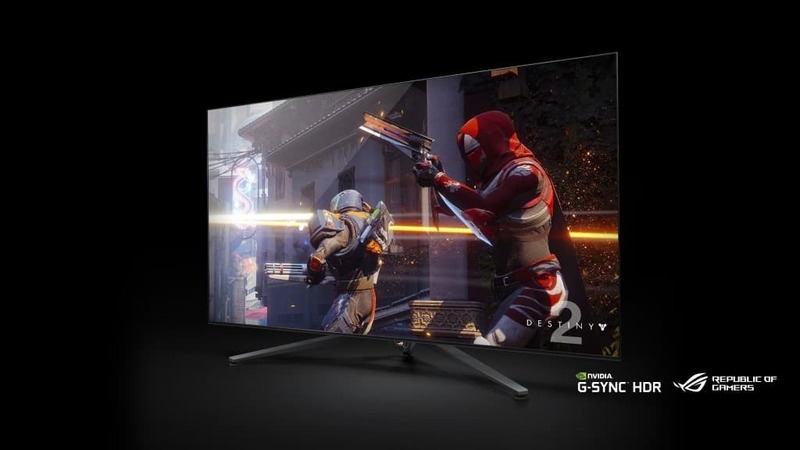 Big Format Gaming Displays come as 4K and 3440x1440 G-SYNC HDR displays that match the responsiveness of PC gaming monitors but offer more than that thanks to the built-in Nvidia Shield device and other display optimizations. Nvidia claims that the devices run 4K at 120Hz, have G-Sync technology and HDR with 1000 nit peak brightness. The integrated Nvidia Shield device brings streaming to the monitor. It supports Netflix, Amazon Video and YouTube at 4k, Nvidia Gamestream, and Android games and apps (since the Shield uses Android code). Nvidia won't produce the displays itself but partnered up with Acer, Asus, and HP. The partners will reveal 65-inch gaming monitors that received Nvidia's stamp of approval later this year. These TVs work as smart TVs but thanks to the integrated Nvidia Shield, act as a gaming system as well. In fact, the primary purpose that customers may select a BFGD monitor over comparable smart-monitors is the integration and optimization for gaming. While you can buy a Nvidia Shield device separately and use it as a streaming device on nearly any smart-TV, you won't get the responsiveness or other optimizations that BFGD monitors offer. Nvidia Shield supports GeForce Now, a relatively new PC game streaming service that does the rendering in the cloud before images are streamed to the target device. This means that you don't need a high-end video card, processor, memory, and RAM to play games in high resolution and acceptable frame rates, and with mouse and keyboard support. This comes at a cost though. GeForce Now is not free but costs $7.99 per month. Previous PC streaming services had noticeable lag, and it remains to be seen how lag-free Nvidia's system is overall. Game streaming offers some advantages. Users don't need mid to high-end gaming PCs anymore to play the latest computer games. There is also no installing or patching on the user's side of things, and it is possible to play previously purchased games from platforms such as Steam or Battle.net. The built-in Nvidia Shield supports the bulk of popular streaming services that exist on today's Internet. It also supports Kodi and Plex and comes with Google Assistant and Nvidia's own Smart Home technologies functionality. Nvidia did not reveal pricing information at this point in time. It is clear that Big Format Gaming Displays won't be cheap. While the devices may be attractive as TVs as well, the main purpose of the devices is gaming. In fact, the integrated Nvidia Shield device and the gaming optimizations of the display will certainly be reflected in the price. I think it all comes down to how well the PC game streaming works. If Nvidia managed to eliminate the lag to a margin that is not noticeable, it could become an attractive option for gamers who don't want to invest in new hardware regularly, do the installing or patching on their own, or want to play PC games on the big screen instead. Now you: Have you tried PC game streaming in the past? What's your take on Big Format Gaming Displays? To be honest, I rather have a display WITHOUT any gimmicks build in, for those “smart” stuff in TV’s and such as above always stop working after a couple years. For the adjustments needed by developers for such devices are then stopped, not enough “market share” and other shenanigans. I rather have a TV with NOTHING in it, no speakers, no TV decoder and have that separate so when I have to replace something, I don’t need to replace other components along with it.